The Udaipur plant of Hindustan Zinc Ltd, a part of the UK-based mining company, Vedanta Resources Plc., has about 79 women executives working with 1,168 male officers. At the Lanjigarh unit of its aluminium business, Vedanta Aluminium Ltd, all the 34 women work on the shop floor with their 241 male counterparts. 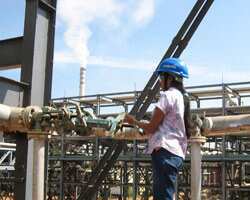 The copper operation in Tuticorin, which Vedanta runs through its subsidiary, Sterlite Industries, has 379 men and 54 women executives from various disciplines such as chemicals, metallurgy, instrumentation, mechanical and electrical engineering. “Except for night shifts, women lead teams, handle projects and shift operations just like any other male employees," says A. Thirunavukkarasu, head, corporate HR, Sterlite Industries India Ltd and Vedanta Group companies in India. The numbers may not be very impressive, but they reflect the definite changes in a once male-dominated workforce—especially in manufacturing, mining and energy industries, where women used to comprise a minuscule percentage of the total headcount. Sterlite, for instance, had only about 5% women employees in its workforce two years ago. The new trend is gathering momentum: The Vedanta group is targeting a 20% share of women employees across companies by 2010. For companies including ICICI Bank Ltd, Hindustan Unilever Ltd (HUL), Vedanta Resources, PepsiCo India Holdings Ltd, Shell and Bharti Airtel Ltd, gender diversity has become a critical area of focus. As a first step in ensuring gender diversity, companies ask headhunters to include a certain number of women among the shortlisted candidates. “More and more companies tell us they would be happy hiring a woman candidate," says Arun Das Mahapatra, managing partner at Heidrick & Struggles India, a placement firm engaged in senior-level search. “Some of them even throw in a higher fee on placing a female candidate," he adds. This stress on gender diversity has become imperative in a talent-starved economy: No organization can afford to ignore this huge untapped talent pool. “More than ever before, companies need to tap women employees across all levels in a market fraught with tight manpower supply," says Rajesh Kurup, associate vice-president and research services director, eTechnology Group, IMRB International, a leading market research firm. While the services industry—including health care, education, hospitality, IT, ITeS, financial, fast-moving consumer goods and media—has an advantage in attracting women, sectors such as manufacturing, heavy engineering, and infrastructure are still struggling to offset the gender tilt. “The male-female ratio in science and technology streams is reflected in the small pool of women candidates with technical skills. This results in tight supply and, therefore, a low proportion of women employees in these verticals," says K. Ramkumar, group head of human resources at ICICI Bank. According to a global gender gap survey by the World Economic Forum in 2007, a decreasing share in enrolment from the secondary level onwards impacts the number of women professionals. Less than 40% of the total graduates in India are women. The management schools don’t fare too well, either. For instance, at the Indian Institute of Management Ahmedabad (IIM-A), 37 of the of 235 students in 2007 were women. “India, till recently, has seen a greater presence of women in industries that don’t significantly impact work-life balance," says Archana Bhaskar, director, HR, Shell. “The petroleum and energy industry is clearly not one of those. And Shell, as one of the latest entrants in the business in India, is thus hampered by the availability of existing talent," she says. The overall percentage of women in non-IT, ITeS sectors is less than 15%. However, in sectors such as banking financial, tourism, hospitality, the number is estimated at 20%. At the senior levels, the proportion of women employees is even lower. “There are programmes in place for identifying women for leadership roles, but the numbers show that companies are yet to understand this as a real business need," says P. Dwarakanath, director, group human capital, Max India Ltd, and president, National Human Resource Development Network, the apex body of HR professionals in India. Heidrick & Struggles, which focuses on the telecom, consumer goods, financial services and health care industry apart from the IT and ITeS sectors, makes about 120-150 senior-level placements every year—less than five of these are women. Says Kurup: “While the proportion of women at the entry level is about 10%, only 7-10% of them make it to the middle level and a mere 3-5% to the top. In contrast, about15-20% of male employees make it to the senior levels." This bottleneck for women in the corporate ladder needs to be addressed to augment maximum returns on gender diversity, experts say. On the one hand, companies need to create a work culture sensitive to the needs of its employees; on the other hand, women too need to adapt to the leadership mindset. “The measures undertaken by PSUs (public sector undertakings) are phenomenal, but even there women are not going all out for top jobs," says C.V. Madhavi, professor and deputy director, Centre for Organisation Development, Hyderabad, a non-profit research and training institute which conducted a study on women in IT and is currently studying women in management roles. Under-representation of women in top jobs is attributed to the fact that career decisions of women, more often than not, depend on marriage, motherhood and family responsibilities. “Most women are reluctant to work towards top management roles, since it would mean spending more hours at the office, travel, and disturbing (their) work-life balance," says Madhavi. “Thus, they prefer staying at the current level or drop out of the workforce," she says. Ramkumar of ICICI echoes the sentiment: “There is a glass ceiling in the minds of companies and women themselves, and that needs to be shattered before a tangible difference can be seen." For instance, HR managers at ICICI Bank find it very difficult to attract women into retail banking. “Women are fine with working in corporate banking, but are not keen to take up jobs in our retail sales business because of the travel and rigour involved," says Ramkumar. Clearly, proactive HR initiatives are needed to bridge the gender gap.